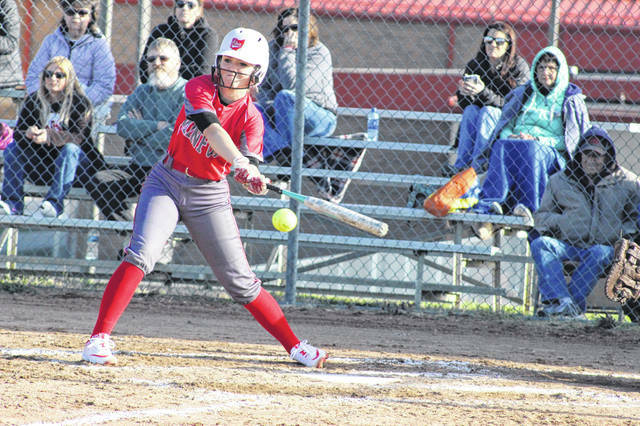 Minford junior Brittani Wolfenbarker’s clutch hit came in the bottom of the third inning, tying the Falcons with Oak Hill at 1-1. 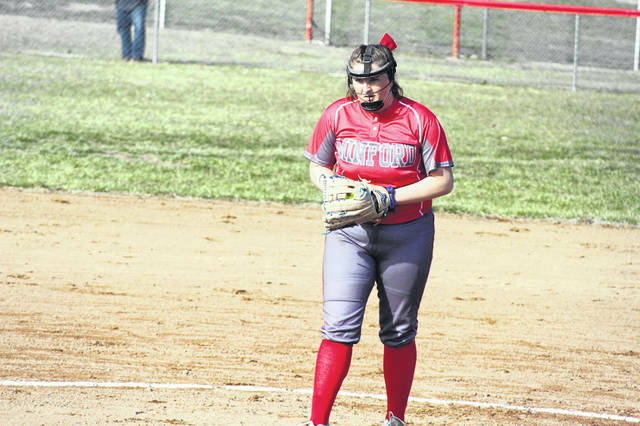 Minford ace Madison Sifford pitched a complete game in the Falcons 4-3 win over Oak Hill Wednesday evening. Minford improves to 2-1 in 2019 following Wednesday night’s victory over Oak Hill. 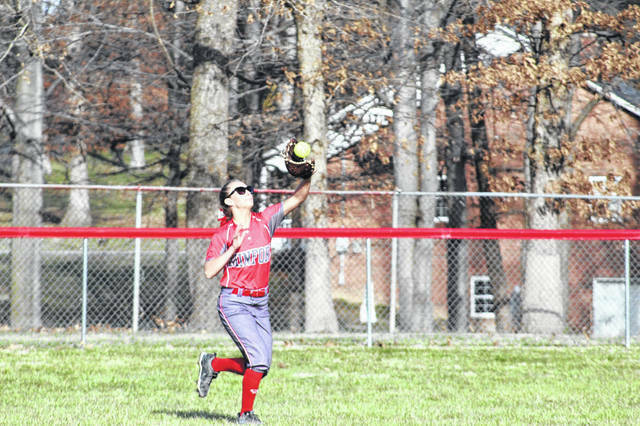 Senior center fielder Emily Shoemaker fields a fly ball in Minford’s 4-3 win over Oak Hill. MINFORD – Minford’s come from behind victory from being down Wednesday night at not one, but two different points showcases why they’ll be a tough out in this year’s regular season and postseason races. It wasn’t home runs or several extra base hits that helped the Falcons rally from one and two run deficits in the third and fourth innings, it was making the right play at the right time, for all nine players on the field. Whether it was a clutch hit, the right defensive play, or knowing when to tag and when to stay at their base, it was all the little things that helped them hold onto their 4-3 lead for the final three innings to defeat Oak Hill Wednesday night in their home opener in 2019. They may have been contact hits, but their importance to Wednesday’s outcome was monumental. It wasn’t just the hits, either. It was ace pitcher Madison Sifford’s ability to escape jam after jam. After giving up two hits and one run to start the top of the first inning, Sifford retired three straight batters to end the Oaks chances at getting another run on the board. This theme would remain constant for the next six innings Sifford would take the mound. Things remained the same until in the bottom of the third, junior Brittani Wolfenbarker picked up an RBI by driving in a Falcon runner with an opposite field hit into left field to tie things up at 1-1. However, in the top of the fourth, Oak Hill would put up two more runs to once again retake the lead at 3-1. 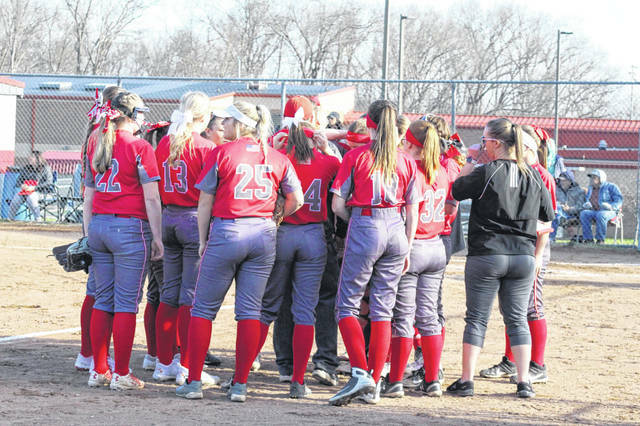 After getting out of the inning facing just a two run deficit, it was time for Minford’s bats to come alive in the bottom half of the inning. The Falcons got runners on, got them over, and got them by tacking on three runs in the bottom of the fourth, one of which came on a wild play where senior first baseman Hannah Thacker was involved in a pickle, was hit in the side with the ball, and crossed home plate due to a past ball where no one was standing at home. Fellow senior Emily Shoemaker who’s glove is just as reliable as her bat, also drove in a runner in junior Maddie Slusher which added another run to the Falcons total. After four innings, Minford led by what would be the final score in 4-3. Over the final three innings, Sifford would retire nine of the final twelve batters she faced to help lead the Falcons to their win. Minford returns to action on Thursday when they will travel to face the Piketon Redstreaks before facing Oak Hill on the road Friday.